Thursday 11th - Sunday 14th July 2019 . Thursday - Monday festival ticket with camping for persons aged 16+ More info here This price also includes a redeemable £5 litter bond. Thursday - Monday festival ticket with camping for persons aged 16+ More info here You will be able to pay off the remaining balance of £105.00 plus postage and £5 litter bond (per ticket) any time before midnight on Friday 31st May 2019. Please be aware that should you fail to pay the balance by this date you will NOT receive a refund and there will no longer be a festival ticket secured for you. Includes a VIP Weekend Parking pass Thursday to Monday festival ticket with camping for persons aged 8+ years. More info here If you order more than 4 x VIP tickets you are eligible for an additional VIP Weekend Parking pass. 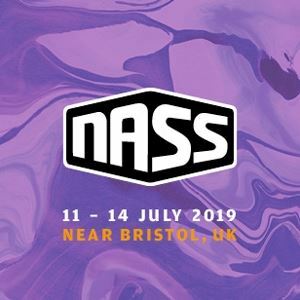 Please e-mail NASS@Seetickets.com with your reference number in order to add the additional parking pass You will be able to pay off the remaining balance of £149.00 plus postage and £5 litter bond (per ticket) any time before midnight on Friday 31st May 2019. Please be aware that should you fail to pay the balance by this date you will NOT receive a refund and there will no longer be a festival ticket secured for you. Thursday to Monday access to NASS GA Car Park for one vehicle. Only valid with a 4 Day Camping Ticket. Thursday to Monday access to NASS Campervan Car Park for one vehicle. Only valid with a 4 Day Camping or VIP Camping ticket. Drop your phone off as many times as you like to one of our phone charge stations Wednesday - Sunday with this deal. NASS has previously supported the likes of Long Live Southbank and Skatepal through generous donations made by our audience. All 2019 donations will be put in to the NASS Foundation so we can continue supporting these worthy causes and organisations. This package includes: Inflatable mattress, bedding & pillows, ground sheet & flooring, and Egyptian cotton bed linen. More info here Please note that a festival entry ticket must also be purchased for each Glamping guest. This package includes: Metal bed frame with foam mattress, bedding & pillows, ground sheet & flooring, Egyptian cotton bed linen, battery operated lanterns, hanging mirror, 2x bath towels and more. More info here Please note that a festival entry ticket must also be purchased for each Glamping guest. This package includes: Metal bed frame with foam mattress, bedding & pillows, ground sheet & flooring, Egyptian cotton bed linen, battery operated lanterns, hanging mirror, 4x bath towels and more. More info here Please note that a festival entry ticket must also be purchased for each Glamping guest. This package includes: Metal bed frame with foam mattress, bedding & pillows, ground sheet & flooring, Egyptian cotton bed linen, bedside table with battery operated lanterns, 2x bath towels and more. More info here Please note that a festival entry ticket must also be purchased for each Glamping guest. This package includes: Metal bed frame with foam mattress, bedding & pillows, ground sheet & flooring, Egyptian cotton bed linen, Eletric brass lanterns, bedside table with battery operated lanterns, 1 charging socket, 2x bath towels and more. More info here Please note that a festival entry ticket must also be purchased for each Glamping guest. This package includes: Metal bed frame with foam mattress, bedding & pillows, ground sheet & flooring, Egyptian cotton bed linen, Eletric brass lanterns, bedside table with battery operated lanterns, 1 charging socket, 4x bath towels and more. More info here Please note that a festival entry ticket must also be purchased for each Glamping guest. * The transaction fee is £1.50 for E-ticket (Print-at-home), £1.50 for Box Office Collection or £2.50 for Standard Delivery.